I didn’t love my first Yin Yoga class. From one public class, I concluded that Yin Yoga was not for me. 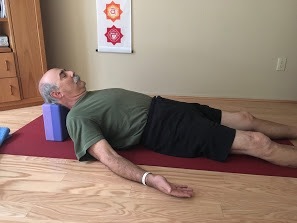 Because I have osteoporosis in my lumbar spine, I experienced a strong aversive response to the many minimally propped forward folds offered in the session. I also had not learned the unfamiliar pose names. All of this led to a bit of mental agitation. Not fair to the practice, or perhaps the teacher. Nonetheless, I decided for several years to avoid this yoga style. Yet some of my students began telling me how much they enjoy Yin Yoga and asked me if I offered Yin classes. I decided to take another look. Toe squat, modified. Opening feet and strengthening ankles. Last February I had the opportunity to participate in Yin Yoga teacher training with Debbie Daly at Tucson Yoga Studio. I happen to be one of the first on-going students at Tucson Yoga, at their original location. Debbie founded the studio in 2003. I’m now honored to teach pre/postnatal yoga there, as well as occasionally substitute. Debbie kindly sought me out and we chatted before training began. All enrolled teachers had the opportunity to tell Debbie our learning goals via email, as well as questions we might like answered. 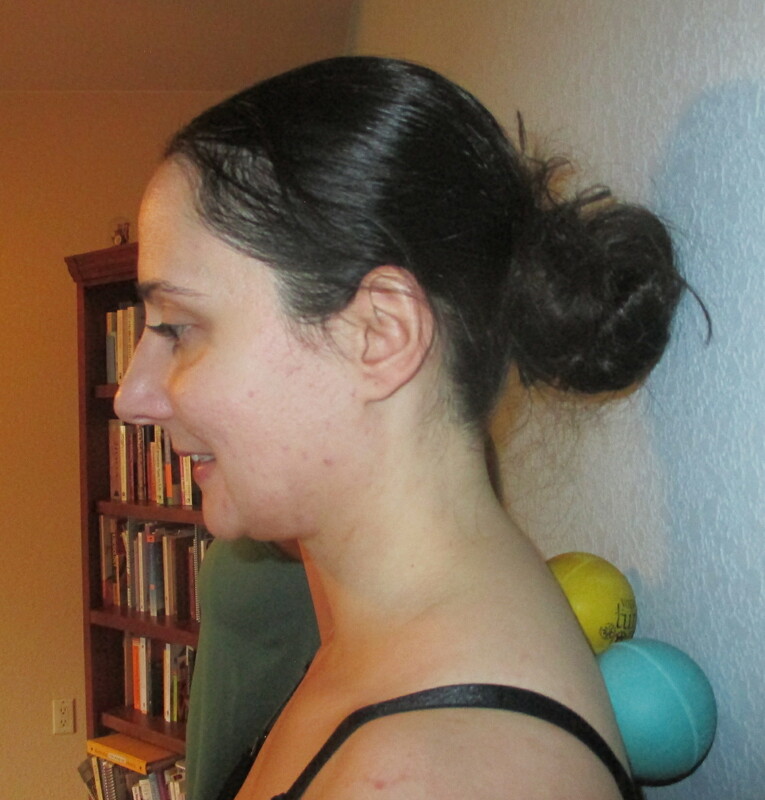 We further discussed my concerns about forward folds in particular, especially in light of my spinal osteoporosis. We had a wonderful, mutually respectful, and collegial discussion and continued to touch base throughout the training, and after. As my learning progressed, I had the space and time to understand the “whys” of Yin Yoga. 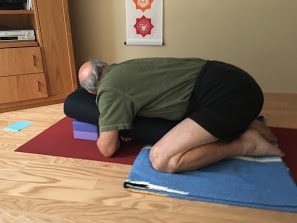 I experienced Debbie’s exquisitely guided sequences myself, partnered with other teacher trainees in Yin Yoga assists, and practiced all the cool ways to use props in Yin. Immediately that weekend in my own classes, I began integrating a few poses. Yin Yoga poses are held anywhere from 2-5 minutes; depending on the pose and the person. The essence of Yin practice is creating stillness in a physical shape, and as Bernie Clark says “play the edge” of comfort/discomfort. This good stress (not pain!) on our connective tissues and joints stimulates circulation, growth and healing. Gravity assists release. We stress not stretch the deep tissues. Stress, in the Yin Yoga context, is tissue stimulation and not stagnation. This is a good thing! A Yin pose takes time to inhabit. Motion is slow, particularly coming out of a pose as your physical being adjusts. We practice quieting the mind in these long holds. Meditative calm ensues. So yes, I’ve become a convert to Yin Yoga! I have had many trainings over the years in Yoga Tune Up® with Jill Miller. Most recently, I achieved Roll Model Method® certification with Laurie Streff. In the Yin and Roll Model context, I continue my education about fascia with a decent understanding of how issues in the connective tissues impact our entire physical and even mental state. I often offer ball work in my classes, as well as now integrate Yin poses. Yoga Tune Up® ball tissue massage for the upper back. In my upcoming workshop “Tonic for the Tissues” we pair ball work with Yin poses for deep release. Would love to see you at the WORKSHOP or in my classes!